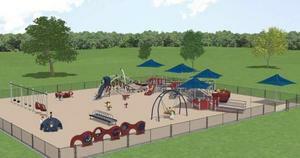 Volunteer Park is a proposed all inclusive park which will provide playground facilities to all people regardless of their physical or mental limitations. The purpose of the Selah Parks Foundation brick fundraiser is to raise matching funds for the development of Volunteer Park. The City of Selah has been awarded a grant of $359,000 which requires matching funds to be able to distribute. The grant parameters have limited the city to contributing $150,000. This leaves us with $241,000 to fundraise in donations, goods, and services to be able to complete such a monumental project in our community. Purchasing a brick though the Foundation is an incredible way to support this community project. The bricks will be placed at the entrance to the park, adjacent to the parking lot and the playground itself. Donations in excess of the required matching funds will be used exclusively, on this park, for future maintenance and continued development. With your donation, you will be able to personalize a brick. Both upper and lower case characters may be utilized. Brick sizes vary from the standard brick size of 8” by 4” available for $100 to the larger size of 8” by 8” for $250. Each brick will be nutmeg in color (with slight variations), laser inscribed, and epoxy filled in black. You may choose to submit your own company logo to be engraved on an 8x8 brick. This brick will cost $500. Please submit your brick order through this website utilizing PayPal. You can also print off your order form and mail it with a check. The address should print on your order form and is also listed at the bottom of this page. This will ensure your brick order is customized to your liking and not subject to typing/spelling errors. If you have questions about this project you can email us at selahparksfoundation@gmail.com or talk to Charlie Brown, the Parks and Recreation Manager, by calling 509-698-7301. All matching funds will need to be collected by May 1, 2015. All donations after that date will go towards the future maintenance of the park and not directly to its development. Please make sure all fields on this form are completed before submitting your order. Thank you! How do I pay for my brick? When you order your brick online, you have the option to use a credit card (with PAY PAL) or you can mail a check to the Selah Parks Foundation. Mailing address for the check is listed on the order form and at the bottom of this page. I’d like to put a symbol on the brick – is that possible? Yes, there are about 12 symbols available to choose from, and there is no additional charge, but the symbol is considered part of the allotted number of spaces available. When you place your order, the design will pop up on the screen. Symbols will be placed on lines 1, 2, or 3, if you are ordering an 8x8 or 16x16 and would like them on a different line please use the NOTES field to describe where you would like them placed. If you would like to request more than one symbol please use the NOTES field for that request as well. My company would like to purchase an 8x8 brick with a company logo. How do I do that? You will need to follow the regular check out process by selecting the Volunteer Park 8x8 with Logo. After you have submitted your order, please email the company logo in a PDF file to selahparksfoundation@gmail.com and we’ll make sure it’s on the brick. Get your personalized brick today!